Jesus, the Sunrise MV gave me a heart attack. I just have too many theories in my mind at the moment. I'll update on the Forum when I'm free. This is Scenario 1 which is a horrible ending and theory and it hurts my heart so much. But meanwhile, it does make some sense so I decided to write about it first. (0:00-0:12) Umji said: "I had a dream last night. The moment we could be together was just short, we were not far away from each other.” "We were not far away from each other.”????!!! The first time I saw this translation and this theory just pop in my mind and it hurt me so much. (0:00-0:07) Sowon & SinB are the only ones in the room. (0:14) Eunha is playing the piano but isn't that the same flower at(0:10)? Also, she is isolated and alone, which could prove she is probably in heaven from surroundings. (0:30) Notice the Song Names on The Disk? Gfriend's old title tracks. SinB is probably following Yerin(Listening to the Tape in TFTMN). To recall their happy moments with Eunha. (0:40-0:42) The creep starts here, Yerin is waiting for a call, but from who? All the other members are not calling in the MV. Is she in a healthy mental situation? Why is she acting like this? (1:10) That's not a normal light, more like an Alarm. (1:10-1:16) How come Eunha is back to life? And they are happily celebrating the birthday of someone? I think this is from SinB's dream(as she is sleeping at the start). (1:35-1:45) The craziest moment in this Scenario, at the start it seems that Umji and SinB are just sleeping against Sowon on the sofa, but later, they are all on the ground. And Until (1:45) All of them seemed asleep, but it could also be they have fainted. Why? (1:45) looks blurry and looks like smoke is in the house. I think they are performing a group suicide. (Burning Coal in a closed room) With the reducing oxygen, SinB and Umji fainted first, then Sowon as well. The result of the suicide? Yerin----Alive, but in unstable mental condition (Due to a huge intake of smoke). That's why she performed weird earlier at (0:40-0:42) and (0:50). Umji----Alive, but in unstable mental condition (Due to a huge intake of smoke). (2:13)(2:24-2:26) Flowers again, but this time it's Yerin with a telephone, alone. I think this resembles she is DEAD as well as she is in a similar condition with Eunha. How? I think with her unstable mental condition and her moment looking at rooftop, she might have committed suicide after the group suicide event, and in heaven, she tried to call someone? I believe she tries to call Eunha. Yuju is probably dead as well. I think she committed suicide by drinking poisonous tea(2:04) after the group suicide event. And later in (2:57), Yuju and SinB are in a tunnel full of smoke with a light in the end. I think this resembles the road to heaven. SinB was on the edge of death that's why she met the suicided Yuju in the tunnel. But at (3:04), the camera is pulled away from Yuju, I think this means that SinB is leaving the tunnel, she is saved. Umji is the most complicated, it seems she is fine after the group suicide(fixing puzzle, looking at music score of Sunrise, but she later was playing the piano in a while room with paper planes. (2:45) I think this means that she is dead as well. Although I don't have evidence to show that. Umji was quite calm although sad through the whole MV. That's why I'm doubting myself. After the chaos, ends at (3:05), the third part of SinB's Dream. This time, all the members are together. After TFTMN, the members are devasted to see Eunha. As they gather up to have a group suicide by burning coal in a house. (In some scenes we could see smoke in the house). During the suicide process, Sowon realized they shouldn't do this so she gets up and opens the window to save the others. All the member were saved but Yerin, Yuju, and Umji later committed suicide by themselves. Although Yerin made to the heaven, she didn't see Eunha. Yuju met SinB in the tunnel to heaven and witness SinB being saved. Umji seems to be the closest to reach Eunha as she was playing the piano and in a while environment(Similar to Eunha's Environment and said "We were not far away from each other.” ). In Real Life, Sowon was guilty as she goes through the album to recall all the dead members. Meanwhile, SinB also was alive and recovered as she uses the disk to recall the dead members. SinB can't hold her tears at the end of the MV as now Eunha, Yerin, Yuju, and Umji are all dead which left only her and Sowon. I personally don't like this Scenario as it's so heartbroken and has so many uncertain points. But I decided to post it anyways. Sunrise in my other Scenarios are the end of the series. But not this one, how will Sowon and Sinb deal with even more pain? Under this Scenario, we need another comeback to find out. Anyway, that's about it. Hu~ So Sad but I finished. I will probably post my other Scenarios in the coming days. Trust me, the other Scenarios(1 or 2) are going to be much more relaxed than this tragedy. Indeed, guessing the MV is fun and enjoyable because you can connect the dot to the previous MV. It's just like there should be a meaning as to why the MV director shooting the scenes like that. 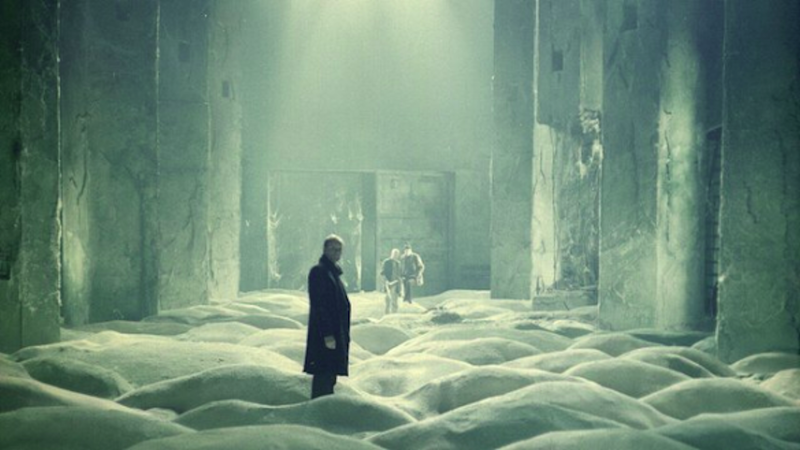 Your analysis reminds me of me watching Stalker (1976) by Andrei Tarkovsky. Just by looking at this image, there are a lot of interpretation by movie lovers tho. If you're interested, you can check it on Youtube for the analysis.